CRAZY DISCOUNT! Was: $129.95 Now: $79.98! 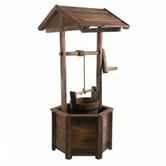 Add a spot of tranquility to your garden with this Wooden Wishing Well. 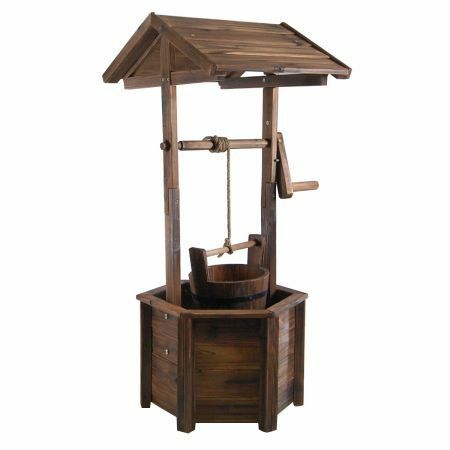 Made from treated fir timber, this cute little wishing well has its own rooftop with hexagonal base and real working hand crank for lowering and lifting the attached bucket. Create a sense of serene calm and peacefulness in your backyard, garden or entertaining area. Sure to be an interesting talking point in your garden that will impress guests, friends and family. Use it as a decorative feature and create a sense of wonder within your own private garden getaway to relax your weekend away! (L x W x H) 42.5cm x 37.5cm x 96cm approx. (L x W x H) 46cm x 40 cm x 39cm approx. Thanks alot great service Col.